Introduction: Primary May-Thurner Syndrome, results from the compression of the left common iliac vein by the right common iliac artery and the 5fth vertebral body. 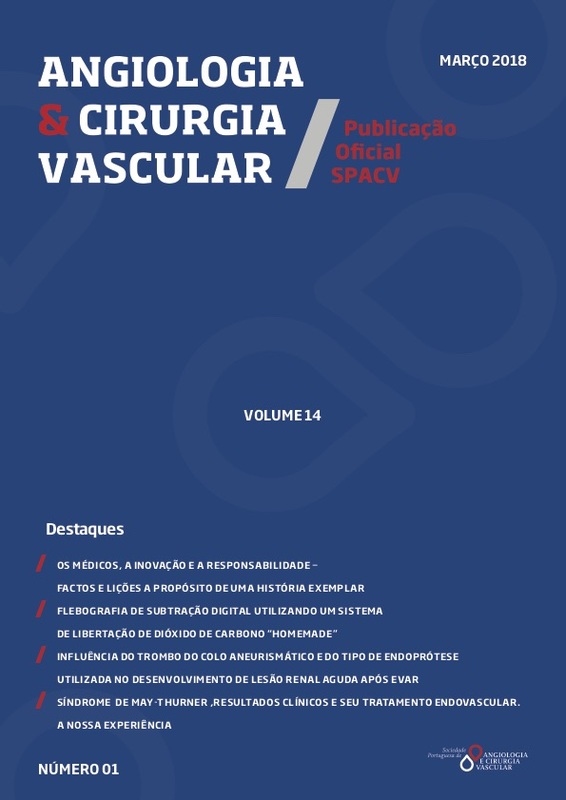 Methods and material: Retrospective analysis based on the clinical and imagiological records related to 21 patients diagnosed with non complicated May-Thurner Syndrome who underwent endovascular surgical treatment. The SPSS statistic 21 IBM was used to do a uni and bivariated descriptive analysis as so as the realization of the hypothesis test. Results: The mean age was 44 years old, and 90% were female,with two peaks of incidence: one during the third decade of life, and the other during the fifth and sixth decades. The most common symptom was left inferior limb edema (85%), the mean time between the beginning of the symptoms and the diagnosis was 5,05 years and the treatment was primary stenting in 90,5% of the cases. With a mean follow-up of 54,43 months, the primary patency was 85,7% and the primary assisted patency was 100%. All patients submitted to angioplasty alone necessitate a stenting posteriorly. On the sixteen patients that were classified by the Venous Clinical Severity Score (VCSS), it was shown a statistically significant improvement on the post-operatory scores related to pain, the left inferior limb edema and the global score. There was a significant correlation between the time between the beginning of symptoms and diagnosis ,and the post-operatory edema score. Discussion/Conclusion: An assisted primary patency of 100% was observed according to the published literature. The delayed diagnosis of the MTS may correspond to the lack of clinical knowledge and was associated with poor results. (May-Thurner) syndrome. J Vasc Interv Radiol. 11, 2000, pp. 823-836. Vasc Interv Radiol. 11, 2000, pp. 1297-302.
and iliac veins. Am J Med Sci. 135, 1908, pp. 342-346.
mouth of the left common iliac vein. Am Heart J. 26, 1943, pp. 737-750.
of thrombosis of the pelvic veins. Angiology. 8, 1957, pp. 419-448. 6. Cockett, FB e Thomas, ML. The iliac compression syndrome. Br J Surg. Interv Radiol. 27, 2016, pp. 167-173.
compression syndrome. J Vasc Nurs. 23, 2005, pp. 10-17.
compression syndrome. J Vasc Surg. 34, 2001, pp. 106-113. Surg. 36, 2002, pp. 51-57. 12. Ley, EJ, et al. Endovascular management of iliac vein occlusive disease. Ann Vasc Surg. 18, 2004, pp. 228-233. Interv Radiol. 13, 2002, pp. 523-527.
obstructed vein. J vasc Surg. 35, 2002, pp. 694-700.
report of ten cases. J Cardiovasc Surg. 11, 1970, pp. 389-392. Surg. 40, 1992, pp. 9-15.
surgery. Philadelphia: Elsevier, 2005, pp. 2303-2320.
vena cava for nonmalignant occlusive disease. J Vasc Surg. 33, pp. 320-328.
disease. J Vasc Interv Radiol. 23, 2012, Vol. 4, pp. 497-502.
syndrome. Chin Med J (Engl). 124, 2011, Vol. 20, pp. 3281-3284.
result. J Vasc Surg. 46, 2007, Vol. 5, pp. 979-990. 22. Raju, S, Ward, Jr M e Kirk, O. A modification of iliac vein stent technique. Ann Vasc Surg. 28, 2014, Vol. 6, pp. 1485-1492.
stenting. Cardiovasc Intervent Radiol. 37, 2014, pp. 889-897.
center. European Journal of Radiology. 85, 2015, pp. 7-14. Vasc Surg. 53, 2011, pp. 706-712. Surg. 46, 2007, pp. 743-749.
venous disease: the UIP consensus according to scientific evidence. International Angiology. 35, 2016, Vol. 3, pp. 236-352. Surg. 52, 2010, pp. 1387-96.